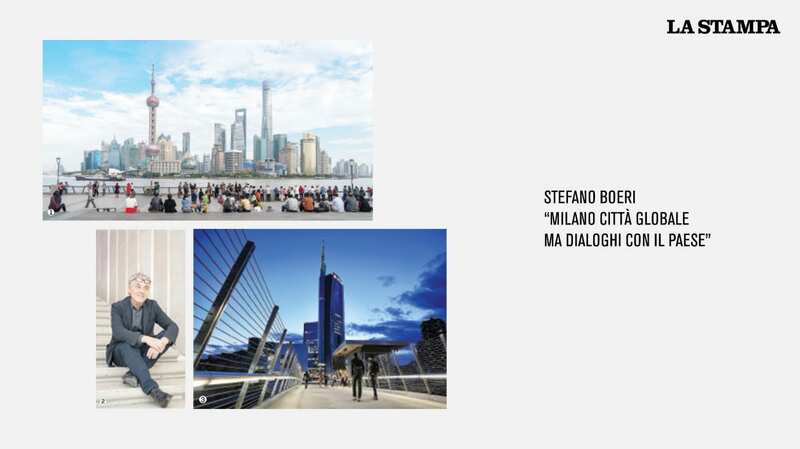 On La Stampa an interview by Alberto Mattioli to Stefano Boeri who, starting from the last Aspenia’s issue, the Aspen Institute Italia magazine, reflect on the condition of the contemporary city, which for connections and dynamics is defined as city state or global city. “Global cities are the ones that have internalised mobility and knowledge networks in their urban bodies. Cities that have the world inside, a concentration of financial, commercial and cultural connections. City state is the one that seek a policy dominance on a wider territory, which can coincide with the whole national territory”. So in London and Paris the two conditions are coinciding, while Frankfurt and the new huge Chinese conurbations have redefined the metropolis hierarchies and are global cities that refers to an international scale, but are not city state. Milan neither, but according to Stefano Boeri “is already a global city, the only one in Italy. The world is already represented in Milan”, which still has to maintain a dialogue with political and territorial diversity, with a generous and inclusive approach.